This is again hard level and breaking all jellies is not easy within 18 moves and to complete requirement you should play with good trick. You should use your moves in breaking jellies or in making special candies. 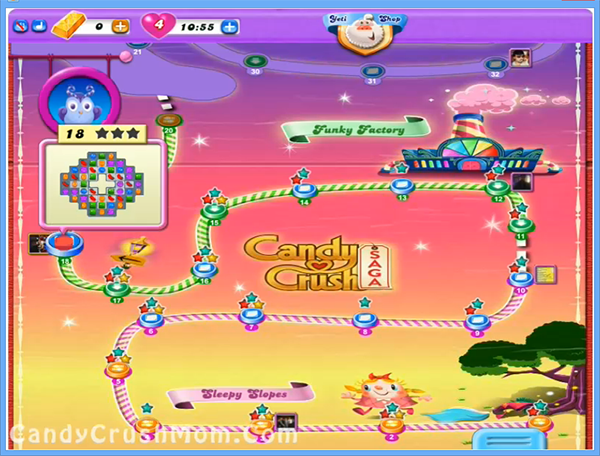 You must need to make special moves and you can make by combining striped candy that you can get by combing four candies and wrapped candy by making ‘L’ or ‘T’ shape of candies and try to combine with each other to break three columns and three rows. You mush not forget to balance the Odus owl and try to make full power of moon. We completed this level with 103320 score by making more special candies and at the end remaining moves converted to fish booster that help to add more points on score board.